ABC Life Members can avail the hard copy of the Photo ID card and Membership Certificate, which will be shipped after the 60-90 days of membership approval. Discount on registration fee (generally 20%) for all the International Conferences conducted by ABC. ABC life members can apply and avail 50% discount on fee for any training courses as and when the announcement is made. ABC also publishes number of International Journals. 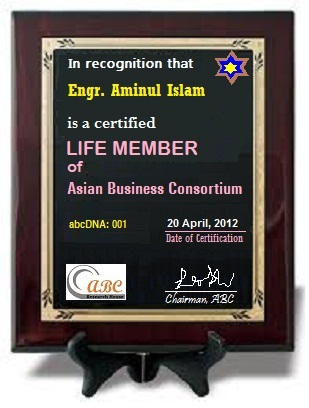 Preference (on printing with 20% discount) will be given to ABC Life Members whose papers are selected for publications. All the life members, by default, will be there in the ABC scientific and technical committees of the conferences, seminar, workshop or any research and development activities organized or sponsored by the research house. ABC will invite/offer you to attend/organize/review to be part of any conferences, seminar, workshop or any research activities etc. Order a certificate or plaque for your home or your office or both. The ABC certificate or plaque is the perfect way to show your pride in your profession! The certificates are signed by the ABC Chairman and the plaques come in a handsome fresco finish, both are available to life members. Certificates and plaques are personalized with your name, highest degree title, and the date you become a member or affiliate of the Asian Business Consortium. 2Checkout.com Inc. (Ohio, USA) is a payment facilitator for goods and services provided by Asian Business Consortium.